Fluor Corporation announced today that the University of Colorado A Line of the Denver Eagle P3 Commuter Rail Project has been completed and is now open to the general public. 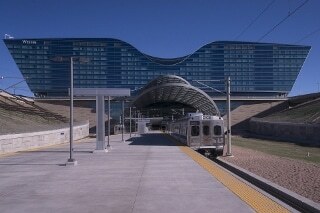 The 23-mile electric commuter rail line between downtown Denver Union Station and Denver International Airport officially opened on Friday, April 22, 2016. The University of Colorado A Line contains eight stations along the route and uses new rail cars that are a first-of-their kind in Denver with level boarding to better accommodate travelers with luggage and accessibility needs. The cars reach top speeds of 79 mph and can carry up to 200 passengers. In addition to RTD’s University of Colorado A Line, the Eagle P3 project also includes the Gold Line between Denver Union Station and Arvada/Wheat Ridge; an initial segment of the Northwest Rail Line to South Westminster, called the B Line; and the LEED Gold certificated Commuter Rail Maintenance Facility (CRMF). Using the Design-Build-Finance-Operate-Maintain model, or DBFOM, Denver Transit Partners, a Fluor-led joint venture, will also operate and maintain the University of Colorado A Line, G Line, B Line and the CRMF for the next 28 years. The Eagle P3 project is a public-private partnership that was awarded by Denver’s Regional Transportation District (RTD) to the Fluor-led joint venture of Denver Transit Partners (DTP). DTP is comprised of a partnership between Fluor; Denver Rail (Eagle) Holdings, Inc., a unit of John Laing plc; and Aberdeen Infrastructure Investments (No. 4) USA LLC, a unit of Aberdeen Global Infrastructure Partners LP. Other team members include Balfour Beatty Rail, ACI, Ames Construction, Hyundai Rotem and HDR. The Eagle P3 project is part of the RTD’s voter-approved FasTracks program to build 122 miles of commuter rail and light rail, 18 miles of bus rapid transit service, add 21,000 new parking spaces, redevelop Denver Union Station and redirect bus service to better connect the eight-county district. For more information, visit www.rtd-denver.com. For more information about the University of Colorado A Line project, visit http://www.rtd-denver.com/a-line-media.shtml.